The TwineSocial platform is designed to acquire social media content; normalize and filter and moderate the content; approve content that best represents your brand identity; republish earned and social content on brand channels; promote official & partner social media accounts, and measure the viral performance of social media content. What Can I Use TwineSocial For? Micro-sites that showcase user generated #hashtag content. Our native SDKs and APIs offer incredible flexibility to build the application that's right for you. To get started, you'll need to create an account. Our free 7-day trials give you full, unlimited access to the TwineSocial Platform, our SDKs, and our APIs. This document walks you through the features available to you after creating your platform account. Tip: After connecting your social account, a default feed will be created for you. For example, if you connect the @Nike Twitter account, you'll find a @nike data feed configured for you under the Feeds tab. Import all items posted to a Facebook Page. Import content posted or uploaded to a specific Facebook Album. Import content posted that @mentions a Facebook Page. Import content posted that a Facebook Page is tagged in. Import content posted that were published to Facebook by a Facebook Page. Import all tweets authored by a Twitter user. Import tweets that contain a specific #hashtag. Import tweets that mentions another Twitter user. Import videos uploaded by a YouTube user. Import videos on a YouTube playlist. Import videos where the title, caption, or description contains a key phrase. Import videos uploaded to a YouTube channel. Import photos and videos posted by an Instagram user. Import photos and videos where the description or comments contain a #hashtag. Import photos and videos tagged to a geo location. Import videos tagged with a specific #hashtag. Import content posted by a Slideshare user. Import content tagged with a specific #hashtag. Import content pinned by a Pinterest user. Import videos uploaded by a Vimeo User. Import photos and videos uploaded to a Flickr Gallery. Import photos and videos that belong to a Flickr Group. Import photos and videos uploaded by a Flickr User. Import photos and videos where the metadata contains a key phrase. Import photos and videos tagged with a key phrase. 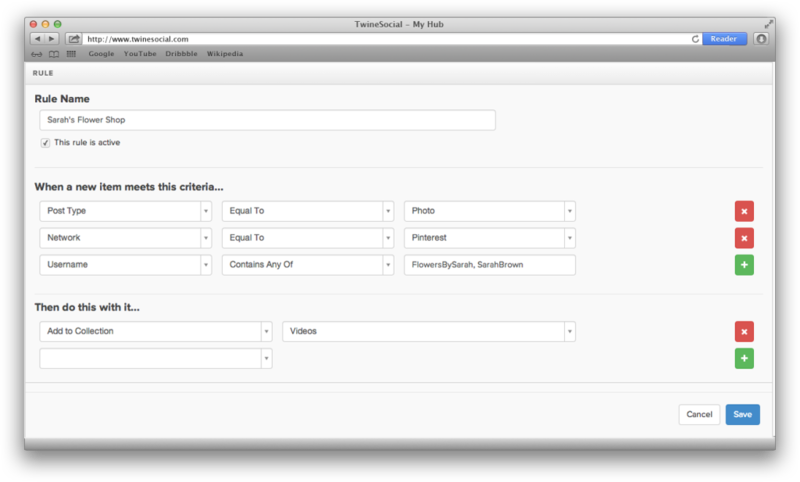 Import photos and videos that belong to a Flickr Album (a.k.a. "Photoset"). Import items from a RSS Feed. Automatically detect and support feeds in the Atom 1, RSS 1.0, RSS 2.01, and RSS 0.91 formats. After you’ve connected your first social media account, configure the TwineSocial platform to ingest your social content. You can use any combination of #hashtags, @user accounts, locations, and much more to control which content is actually displayed. You can configure the TwineSocial platform to import content from many popular sources, such as Facebook, Twitter, Instagram, Google+, YouTube, RSS feeds, and more. Once you add a data feed, the TwineSocial platform will monitor that data source for new items, automatically adding them to your data store. To create a Twitter hashtag feed, click on Campaigns in the left navigation pane. Choose your Campaign, and choose Feeds from the top navigation pane. Scroll down to Twitter. Set the feed type to Twitter Hashtag and enter the hashtag you wish to import. If you choose the Moderation setting of Moderate then all your new content for this feed will get sent to a Moderation folder for you (or one of your administrators) to selectively approve. Keep in mind that no content will be displayed if you set this to Moderate and then forget to approve content. Plus, your content will only be as fresh as your most recent visit to your Moderate tab. Each plan offers data collection intervals designed to match your needs. Upgrade to a higher plan to get more frequent data collection, including near real-time data collection. The TwineSocial Platform offers a variety of powerful tools to allow you to automatically and manually filter content before and after it is added to your campaign. You can automatically filter content before it is added to your campaign. Any new post that contains any username or keyword provided in the data feed filter box will be excluded. Filters only apply to new posts; if you've previously imported posts, then they'll remain on the wall unless you moderate them out or recrawl your feed. Our Rules Engine offers an even more advanced technique to filter content by nearly every attribute, and to combine your filters with boolean operators. To create a collection, login to your Admin Console. Choose Campaigns from the left navigation pane. Choose Collections from the top menu. From this page, you can manage existing collections, change the display order of collections, and add new collections. You can also create rules to automatically add content to a collection that meets a specific criteria: from a particular user, from a particular network, or with a specific hashtag. Learn how to configure rules. When using the Web API, you can choose to have a tab-based navigation pane at the top of your campaign content, allowing visitors to navigate through your content by collection. When creating a new collection, you can choose your default collection, indicate whether a collection is visible to the Web API, and change the sort display order of each tab. The Rules Engine lets you select content based on your chosen criteria and selectively take actions: Hide, Approve, Flag for Moderation, Add a CTA, or Add to a Collection. New rules go into effect immediately the next time we crawl each feed. Choose multiple criteria for unlimited control over your social content. For instance, add all posts that contain images, are posted by a given user or users, and use a given hashtag to a collection. What Can I Use Rules For? Rules are incredibly powerful and can be used to design a data workflow that meets a large variety of business requirements. Create a rule to limit collection of content to Tweets containing your specific #hashtag AND a video. Create a rule to require moderation of all content that contains a specific #hashtag. Create a rule to add all posts from a specific official Facebook account to a collection. Create a rule to exclude Retweets from your data store. You can perform multiple actions with content for each rule. Choose to add content to a collection, flag it for moderation, automatically hide or delete it, or approve it for display. And of course you can define as many rules as you like for your social media content. To create a rule, login to your Admin Console. Choose Campaigns from the left navigation pane. Choose a campaign. Choose Rules from the top menu. From this page, you can manage and add rules. The TwineSocial Platform offers a variety of tools to allow you to automatically and manually manage content before and after it is ingested. There are two ways to approach content moderation. Mouse-over each post and click "Approve" to post this item to your campaign. Convenient dropdowns above your campaign let you drill on on unapproved content by data feed, or to see items that have been moderated out. Enter a headline, or simply paste a URL. We’ll retrieve the page, and pull in the relevant photo, video, headline and body copy. The TwineSocial platform offers tools to promote and pin specific pieces of content in your Campaigns. 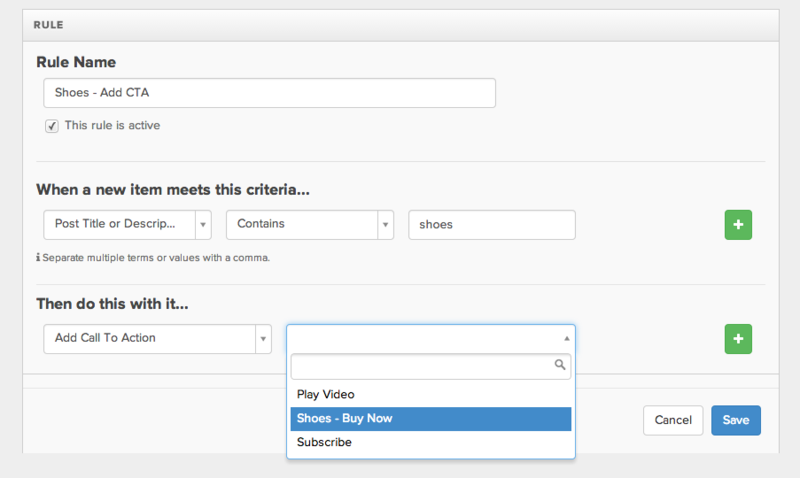 For example, you can feature key brand videos at the top of a social hub. 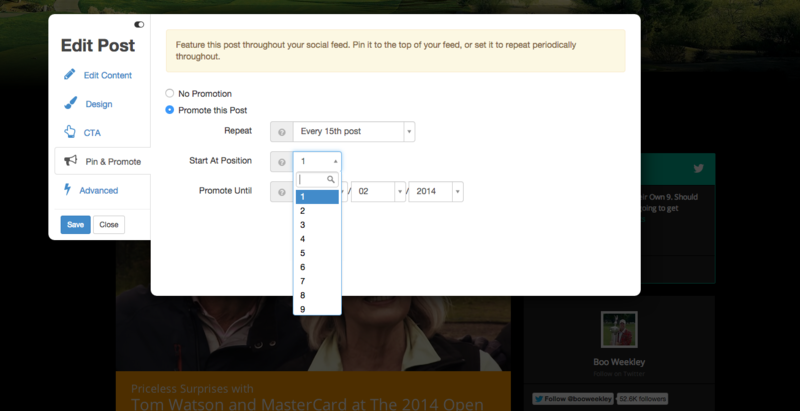 You can also configure posts to repeat in your campaign at regular intervals. You may identify particular pieces of content with strong visual appeal, and want to use TwineSocial’s library of post layouts to give these posts particular emphasis. The TwineSocial Platform supports multi-user functionality, allowing your entire marketing team to work on your campaigns with different levels to match any role: account owner, brand manager, billing administrator, analytics user, content moderator, and designer. And it’s all super-easy to set up. TwineSocial allows you to create unlimited new logins with a variety of permission levels. Account Owners have full privileges to all features on your campaign. Your first TwineSocial user automatically has these privileges. Perfect for marketing producers and campaign planners. Brand Managers can moderate, view and edit campaigns, and check reporting. Perfect for someone maintaining an existing social media campaign. Billing Administrators can view all billing data. Perfect for accounts who don’t want to be bothered (or can’t be trusted) with the rest of your campaigns and content. 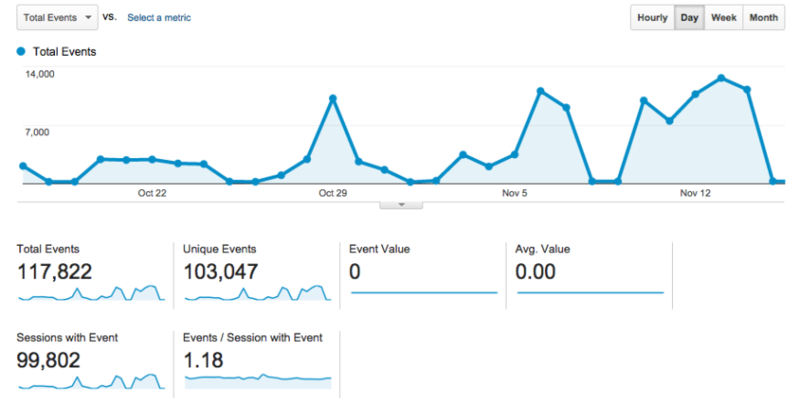 Analytics Users can view our in-depth reporting on your campaigns. 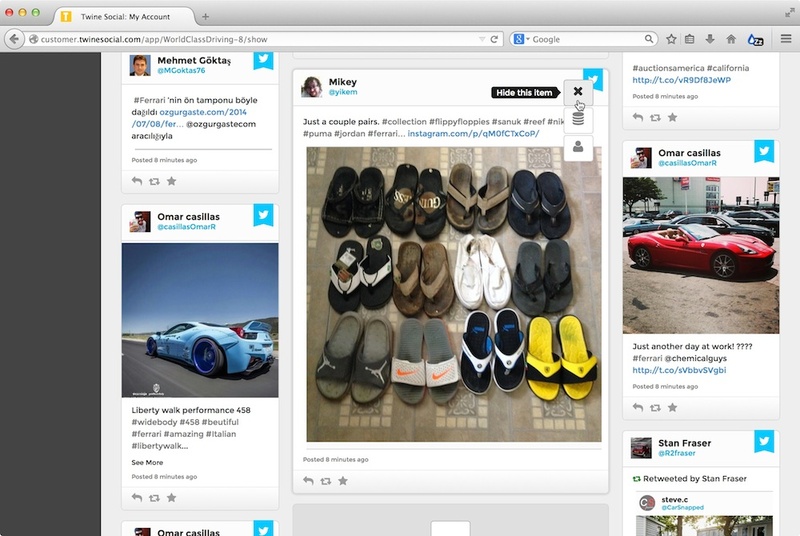 Perfect for account managers who just want a high level view of your social media campaign. Designers can add CSS to your campaigns, change layouts, and make design decisions for your campaign. Perfect for designers who want to be able to customize your campaign without changing anything else. Additionally, you choose which campaigns on your account each user has access to. So if you’re an agency with a large portfolio on TwineSocial, you could give your contact from each of your brands access to only their campaigns. Creating logins for everyone on your social media marketing team is super-easy. Simply navigate to the users tab on the left nav (you must be a Account Owner yourself to see this) and click “Add User”. Then, enter your new user’s information, choose a permissions level, and boom! your new login has been created. You can set usernames and passwords for your social media hub users and even give them custom profile pictures. 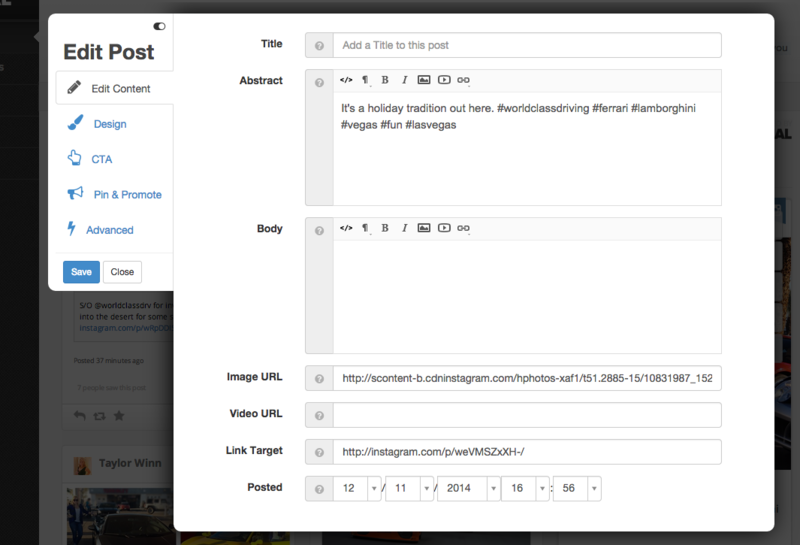 Adding a CTA to posts in your TwineSocial campaigns is simple. CTAs may be added manually, or using our powerful, industry-leading Rules Engine. You can add as many CTA actions as you like. Each CTA can point to a specific URL, and each CTA can be independently styled to match your brand look and feel. Configure your CTAs by choosing a Campaign, then clicking Engagement Tools when logged into your Admin Console. Each CTA click is reported in our Advanced Analytics dashboard, as well as to your Google Analytics account, if you’ve configured it. Adding a Category to posts in your TwineSocial campaigns is simple. Categories may be added manually, or using our powerful, industry-leading Rules Engine. You can add as many Categories as you like. Configure your Categories by choosing a Campaign, then clicking Engagement Tools when logged into your Admin Console. The TwineSocial Platform includes a comprehensive reporting and analytic system. This significantly increases visibility into the engagement and performance of your campaigns. In addition, you can choose to integrate your TwineSocial campaigns with a Google Analytics account. When you login to your Admin Console, you’ll see an Analytics tab in the left navigation. Choose your social hub and period to get quick stats on the number of hub views, engagements, volume of content acquired, popular actions, popular data sources and more. 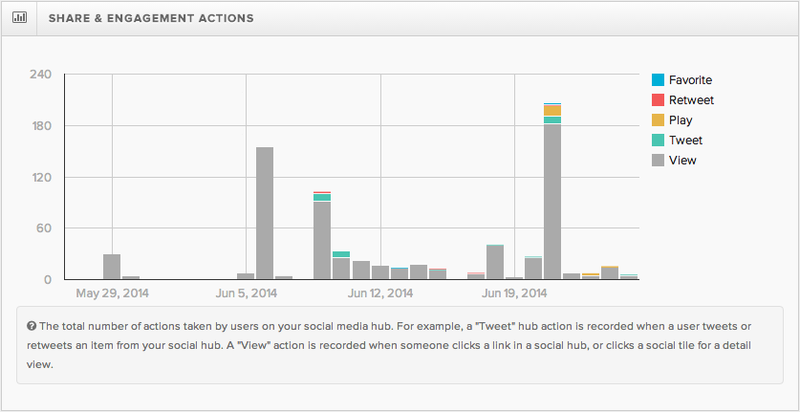 TwineSocial campaigns can be integrated with Google Analytics Event Tracking. 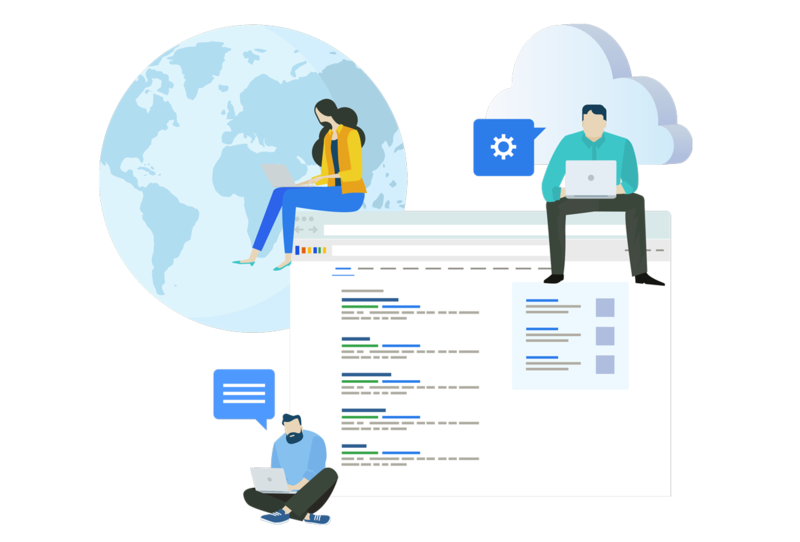 This lets you measure how users interact with the content on your campaigns from within your Google Analytics account. For example, you might want to measure how many times an item was shared on Facebook, or how many times a particular item was retweeted on Twitter. This feature is ideal for agencies and partners who rely on Google Analytics to demonstrate social value to clients. To activate Google Analytics Event Tracking, follow these two integration steps.